The dashboard at hand is supposed to provide insights into the new Lumira 2.0 features: The new composites, the integration of offline data and the adaptive containers are most important to note. Hence, this demo aims at showing how these features work in combination. Moreover, it serves as an inspiration and can be regarded as a template. Data used in dashboard is dummy data only. Visualizations have been chosen randomly to show a variety of chart types (e.g. radar, tag cloud, doughnut). The chosen type may therefore not match the type actually recommended for use for a specific KPI. Feel free to visit this blog regularly to stay up-to-date with the new Lumira innovations. The lumx-file can be downloaded at the end of the page. All relevant elements are binded to the composite properties, so no script is needed here. There is only some script in the formatter functions and for the central function setValues to set the composite properties from outside the composite. Each page of the TabStrip makes use of an adaptive container. In this demo, the adaptive container was configured in a way that it matches tablets, desktops and large desktop screens. There is also a fourth viewport used for smartphones, but it seems that smartphones does not support composites. It is important to note, that due to the architecture of the adaptive container, tiles with charts should always be displayed at the beginning of a block in order to enable an optimal design. The different block size decides whether the lower part of the tile (the chart) is displayed or not. 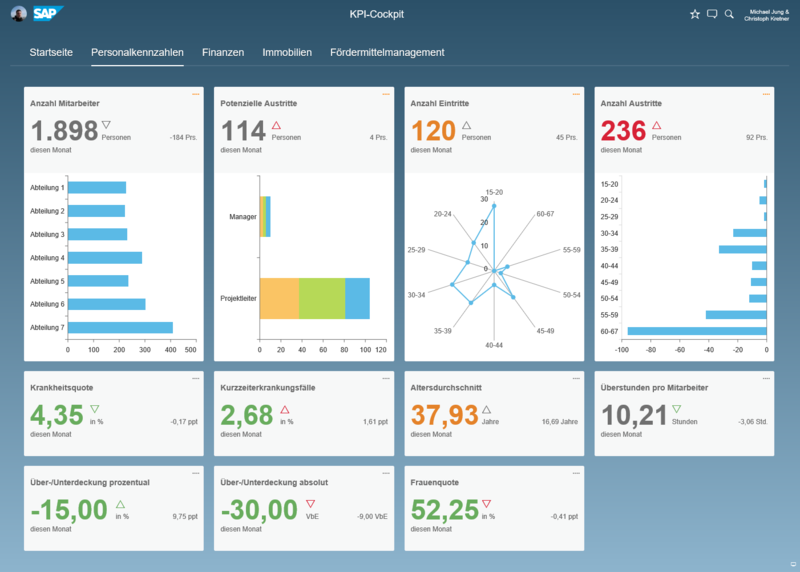 The value “1000” corresponds to the internal ID of the KPI. “KPI_TILE” is the technical name of the tile composite. The values are read from a central DataSource and transferred to each tile via script. The tile itself does not have a data connection, it rather obtains its data using the consuming app and the respective DataSource. If you use a DataSource in a tile, the DataSource is loaded per instance of tile. Therefore, I would not recommend to use DataSources in Composites if you want to use the same composite more than once per Application. In order to display chart data in the tile, the function setChartConfig is invoked within the tile. In this step, the type of the chart and the DataSources from the app are transferred to the tile. The original solution was based on BW and the usage of attributes (KPI as main info object). To simulate attributes i decided to store all masterdata concatenated in one field separated by a “|”. In the onstartup-Event the function “splitMasterdata” is called. In this function the masterdata is read from the DataSource and splitted among the different arrays. For each KPI, one can jump to a detail screen. This detail screen consists of the following areas: monthly progress, description and further evaluation of the KPI (if available). The monthly progress shows the actuals, average and plan values. The description displays a long text for the KPI. The comment field on this page does not have a function. In the original BW-based solution, the text was written back to the BW using a specific planning function type from the BW-IP. The detailed evaluation is always displayed in the same way. This area surely requires revision. However, it does show how KPI-specific evaluations can be integrated in a dashboard of this kind. The map can be found on third tab. Switch to the chart, activate navigation and choose in the chart type picker the map. From technical point of view the chart is set to invisible and the map-component gets visible. Sure, the third tab needs a little bit of rework. In the demo data, several KPIs distributed along the four tabs were already illustrated. If the end user searches for a specific KPI and does not want to click through all of the tabs, he or she can use the search function to directly navigate the desired KPI. The search can alternatively be invoked using CTRL+F. This is just a very simple search solution based on Stringsearch. 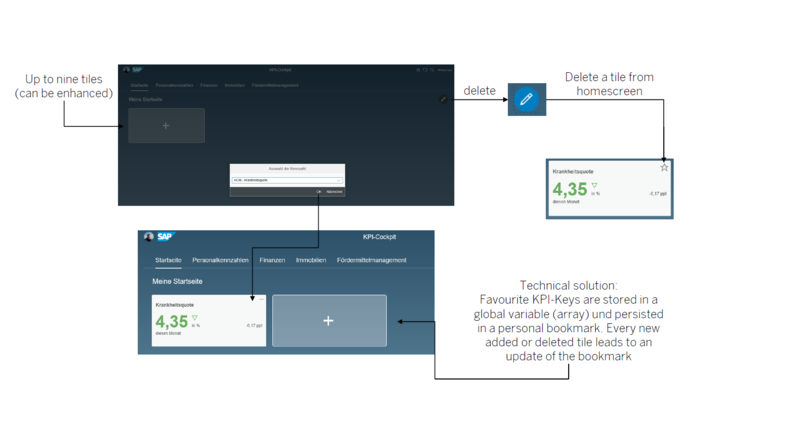 Each user can select and save his favorite KPIs with the Dashboard start page. Up to nine tiles can be stored. Tiles can also be deleted using the ‘delete’-symbol. The ordering is displayed in accordance to the time stamp of recording. Here, the new bookmarks from Lumira 2.0 are used. In the background, solely the IDs (1000,1001, etc.) of the selected tiles are saved and the tiles are rebuild with every start. Please do not rename the lumx-file to avoid script errors during lumira 2.0 runtime. Just copy it to your lumira documents folder. “LUM_C88EE0E557C0A60833590B6DAD6626FA_KPI_TILE” is generated by Lumira Designer so you have to change it. Please use content assistant to find the right one (should be begin with LUM*). Same in GS_TILES-> calcAllTiles. Replace all occurrences of “LUM_C88EE0E557C0A60833590B6DAD6626FA_KPI_TILE” with your new Tile-ID. In 2.0 SP2 PL1 it looks like there is an issue with composites as type in input paramaters of functions so I decided to use generic type “component” and cast it to the right type via “as”.